Plans by London firefighters to strike on Bonfire Night could undermine public support for their cause, PR experts have warned. The Fire Brigades Union is protesting at plans to re-employ 5,500 firefighters on new shift patterns and is planning a 47-hour strike starting on 5 November. Firemen are called out to attend more than twice as many incidents on Bonfire Night. London Fire Brigade receives some 250 calls a day but on 5 November last year it received around 680 calls. George Pascoe-Watson, director at Portland, said: ‘I suspect the unions know the game is up, and they cannot avoid cuts. ‘They are embarked on a nothing-to-lose PR policy of maximum attack, regardless of the consequences. ‘They must know they will lose public sympathy by putting Bonfire Night in peril for millions of families. ‘Those same families are having to cope with cuts, and won't forgive unions who act like they're above the rest of us. ‘We saw this with the BA strikes at Christmas last year, which were called off when union members realised just how hated they would become. 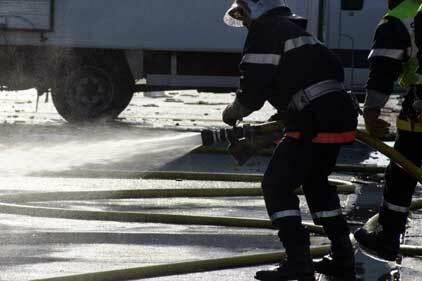 At present firefighters in the capital work two nine-hour day-shifts followed by two 15-hour night-shifts. But London fire commissioner Ron Dobson and Conservative fire authority chairman Brian Coleman want them to work two 12-hour day-shifts followed by two 12-hour night-shifts, with four days off, to allow more time for daytime community fire prevention work. The FBU claims that its members have been threatened with the sack if they do not agree to the new shift patterns. He called for ministers to impose no-strike laws on firefighters. The police are already banned from striking.